Photo: Courtesy of Thomas A. Wynn, National Institute of Allergy and Infectious Diseases (NIAID). Picrosirius Red Stain binds specifically to collagen fibrils of varying diameter that is used to distinguish collagen Type I from Type III. 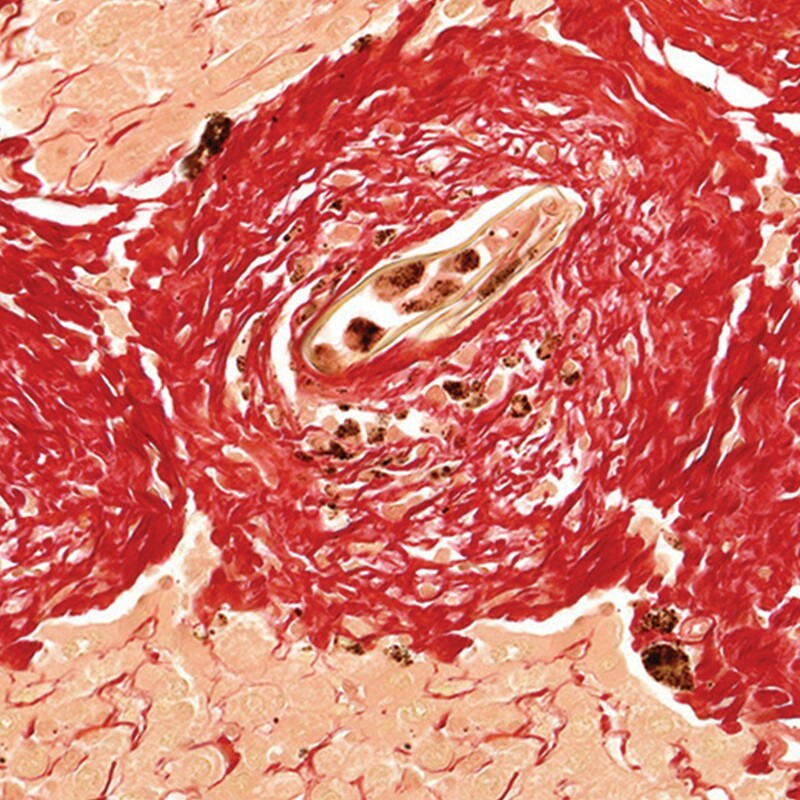 Picrosirius Red Stain will quantify the amount of collagen in a given area of myocardial tissue. Picrosirius Red staining is also useful in the quantitative aspect of liver fibrosis by measuring a change in collagen proportion stained as red (Jang et.al., 2014). Foster, B. L., Sheen, C. R., Hatch, N. E., Liu, J., Cory, E., Narisawa, S., ... & Millán, J. L. (2015). Periodontal defects in the A116T knock-in murine model of odontohypophosphatasia. Journal of dental research, 94(5), 706-714. Rodrigues, T. L., Nagatomo, K. J., Foster, B. L., Nociti Jr, F. H., & Somerman, M. J. (2011). Modulation of phosphate/pyrophosphate metabolism to regenerate the periodontium: a novel in vivo approach. Journal of periodontology, 82(12), 1757-1766. Kelly DJ, Chanty A, Gow, RM, Zhang Y, and Gilbert RE (2005) Protein Kinase CInhibition Attenuates Osteopontin Expression, Macrophage Recruitment, and Tubulointerstitial Injury in Advanced Experimental Diabetic Nephropathy, J Am Soc Nephrol 16: 1654 –1660.